Due to Japan’s sizeable Chinese communities, as well as the heritage of many Japanese families, the presence of Chinese tradition is very much felt in Japan during their Chinese Lunar New Year Festival celebrations. 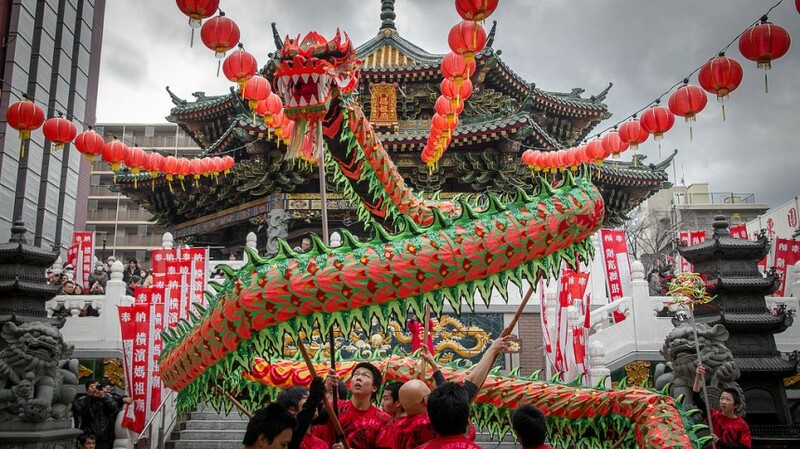 While not a public holiday, there are a number of public events held from mid February to celebrate, including live music, lantern displays, firecrackers, martial arts, tai chi, parades and, of course, the vibrant lion and dragon dances. The epicenter of these celebrations is in Yokohama’s Chukagai (one of the biggest Chinatowns in the world), where celebrations kick off on February 15th with a countdown party. Lion dance parades, accompanied by acrobats and percussion, roll through Yamashitacho Park on February 17th, 18th and 25th. A parade of Chinese costumes is held on the 24th. Kobe and Nagasaki, the other two cities of open trade during the Edo period, have also cultivated large Chinese communities and Chinatowns. Here you’ll find Emperor’s Parades, Dragon Dances and, in Nagasaki, the lighting of around 15,000 Chinese lanterns, which bathe the city in a red glow.